I'm currently adding a new section to a form which consists of two radio buttons, however, I'm struggling to decide if I should include a label for the sake of clarity. Above both of the radio buttons is a brief explanation of the options, so is the label on the first radio button unnecessary? Any feedback would be greatly appreciated. In the numeric field determining the number of months you can put only valid values (like 1, 3, 6, 12, 24, etc.) or place a combobox there with valid durations (like 1 month, 3 months, 1 year, 2 years, etc.). Hide the input field for "month" till the user selects "Fixed term" and display the input field next to "Fixed term" instead of below it, this will make it more obvious that those two elements are related. Have the field and "month(s)" text hide when the "Ongoing" option is selected. That's helpful for clarifying what the expectation is if someone fills in the field but selects the other radio button. Add a trailing ellipsis to the label "Fixed term" (e.g. "Fixed term…"). This is helpful if the "Ongoing" option is selected and the field has been hidden as a way of indicating that more input would be required if you picked the fixed term option instead (this is a bit of a common convention; Apple recommends it for buttons that open other dialogs, for instance). Default to the most likely radio button being selected. If you default to fixed term, that'll preserve the ease of data entry for users (either fill in the number of months, or change to ongoing), and also will ensure you get a validation error if someone fails to set that field. 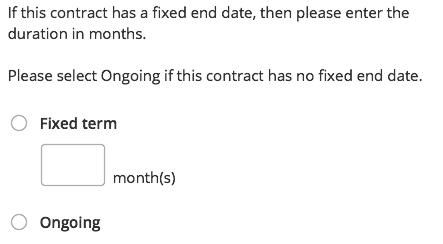 Please select type of contract; (select field > preselected: Ongoing), when users clicks on select field dropdowned is Fixed options also, 3 / 6 / 9 months or whatever can be your case. Can be nicely made with Material UI dropdowns that are looking nicer than standard ones. Not the answer you're looking for? Browse other questions tagged forms labels radio-buttons or ask your own question. Should a 40+ field web form be single or multi-page? What's the best way to explain what the options in a drop down menu mean? Nesting checkboxes inside a radio button: Is there a better way?